I really wanted to have a successful Socktober this year, I was planning to finish a few pair of socks, post a few times about it, etc. Instead I’ve got almost nothing to show for it… And on top of that it’s November, not even October anymore! I ended up starting and finishing only one single sock during the month of October, the Pomatomus in Dream in Color Blue Lagoon. I finished it a few days ago, and I’m quite proud of it! I had been wanting to knit this pattern ever since I started knitting socks but always thought that it was so difficult I’d never be able to knit it. Also, I didn’t think that a sock with 72 stitches around would ever fit me so I never got around to trying it until now. A couple weeks ago I decided that the Blue Lagoon had to become a pair of Pomatomus and I cast on. Of course, I modified the pattern and started it toe up. 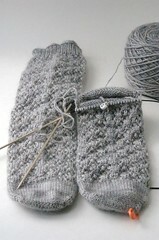 And, after knitting on whole Pomatomus, I have to say that it was quite easy, relatively speaking. I haven’t done as much tinking on a sock I have on this particular sock but overall, it’s just plain ribbing, with a couple yarn overs and decreases here and there… Anyways, here’s a not so great picture until I can get better ones! The sock fits perfectly, even with a lot more stitches than my usual stitch count and I can’t wait to have both socks knitted up! I think they’ll look quite good with my new Danskos! 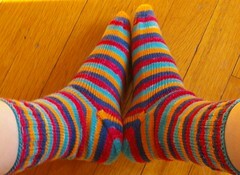 I also finished a pair of socks, the stripey Vesper socks with afterthought heel. I really tried to finish it by October 31, but instead I finished them on November 1st. I wore them yesterday already and they’re quite comfy. I was afraid that the heel would feel a bit weird but not at all, it doesn’t feel any different. I really wanted to finish my Snowflake Lace socks before I left for Stitches but as of November 3rd I admit defeat but I am 2 repeats and 1 ribbing away from completion, and once I come back from Stitches, they’ll be done in no time and I’ll have another pair to wear! To Stitches I’ll be bringing the mate to my Twisted Tweed sock and I’ll possibly wind up another skein for a plain stockinette sock to work on while manning the booth. But I think that if I were to run out it shouldn’t be too hard to find more sock yarn to knit! I will be back next week with hopefully lots of pictures of Stitches! But your single sock is lovely! And you finished a lot more than did I during Socktober – it was the first month in which I didn’t finish any socks this year. Have a great time at Stitches!!! The socks look great! I did get one pair done in October and I think thats pretty good!